A recent TRAI ruling may break the monopoly of content aggregators set up by TV broadcasters. The recent decision of the Telecom Regulatory Authority of India (TRAI) barring content aggregation companies from making bulk deals is another twist in the continuing battle between TV broadcasters and cable operators. Lately the former have had the upper hand, but the TRAIs intervention could well make it a more equal contest. It all began in the days of analog TV, when the fate of broadcasters depended on the willingness of cable operators to beam their channels. Realising their power, cable operators charged broadcasters ever increasing carriage fees and the latter were in no position to bargain. That was when the broadcasters thought of setting up content aggregation companies - rivals otherwise, they decided to come together for the limited purpose of breaking the stranglehold the 60,000-strong army of cable operators had over them. 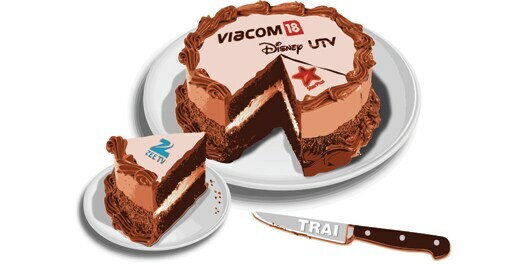 Thus Star India and Zee Entertainment formed Media Pro in 2011, which negotiated with cable operators on carriage fees for the entire bouquet of channels the two broadcasters had. This improved their bargaining position considerably as no cable operator could afford to boycott all the 100-odd channels of Star and Zee. Media Pro was soon followed by IndiaCast, the aggregation arm of Viacom 18 which has close to 34 channels. Multi Screen Media (which owns Sony channels) was already in the aggregation business with One Alliance. The coming together of broadcasters shifted the balance of power in their favour. It was now the turn of cable operators to complain about the monopoly of broadcasters. Cable operators said some channels were being pushed down their throat at a 50-60 per cent mark-up. "The aggregators have been forcing us to buy even non-performing channels," says Jagjit Singh Kohli, Managing Director, Digicable, a multi-service operator . The TRAI move is aimed at breaking the monopoly of aggregators. Though the regulation doesnt specify the dissolution of aggregators, six months from now they will have to seal individual deals for each broadcaster they represent. Media Pro - which represents Zee, Star and Turner - will have separate contracts for each broadcaster, which will lead to a conflict of interest in bargaining for frequency and rates. "We are going to be there in a different avatar now, as agents of broadcasters," says Anuj Gandhi, COO of IndiaCast. But Punit Goenka, Managing Director, Zee Entertainment, says Media Pro was always a time-bound deal: "It is a five-year deal and we are in the third year. The day Media Pro is not required we will dissolve it." Not everybody is optimistic. "Unless there is a retail tariff mechanism, the broadcasters will continue to bully," says Tony DSilva, Managing Director, IndusInd Media and Communications.